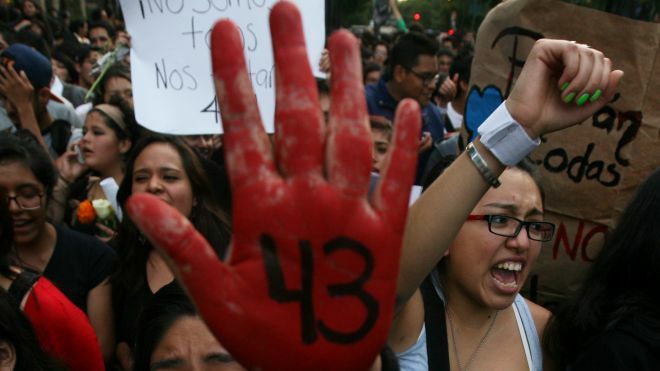 Around six months ago 43 students from the Rural Teacher’s College of Ayotzinapa disappeared whilst on a trip to a political protest in the city of Iguala. Official reports state that the students were taken into custody by corrupt police officials and handed over to the local drug gang Guerreros Unidos – “United Warriors” – who killed the students and burned the bodies. Jesus Murillo Karam, Mexico’s attorney general, insists that the students were killed by the drug cartels and the bodies incinerated at a rubbish dump. Murillo claims his team obtained 39 confessions from police officers, and gang members, and said his report was based on 386 declarations from interviewees, 16 police raids and two reconstructions. Evidence of gas, diesel, burnt rocks and burnt steel were discovered inside tyres at the scene. Murillo also claimed that forensic research showed the fire would have been hot enough to burn all 43 bodies; a statement which has been disputed by Mexican scientists. However, only one student, Alexander Mora, was identified from the remains after a collection of badly burned bones were sent to a laboratory in Austria for DNA analysis. The laboratory said the poor condition of the samples meant they were unable to identify any others. Relatives of the students and independent investigators have broadly rejected the offical explanations due to the lack of conclusive forensic results and the fact that several key suspects are still at large. The college has a history of left wing political activism however it still remains unclear whether the students’ disappearance was linked to their political beliefs. Prosecutors have claimed that Iguala’s mayor, Jose Luis Abarca, orchestrated the students’ arrest because their protest disrupted a planned political speech by his wife, Maria de los Angeles Pineda. The couple fled Iguala city after the incident but were arrested a month later in Mexico City and charged with involvement in organised crime. Iguala’s police chief, Felipe Flores Velasquez, remains a fugitive. The incident which occurred on 26th September 2014 in the Guerrero region has spurred wide spread social unrest across Mexico including attacks on government buildings. Families have campaigned to gain access to inspect army barracks where they allege students may have been taken and hidden. Attorney general Murillo stated at a press conference: “There was not a shred of evidence” that the army were involved. Drug crimes have taken a fatal toll on Mexico over the years. Since 2005 over 100,000 have been killed as a result and the latest figures record the number of missing people at 23,271. The campaigners are also calling for an end to aid provided to Mexico under the Merida Initiative which has given $2.3bn to Mexico to fight drug trafficking since 2008. However, Caravana 43 members claim that the funds are being used to suppress dissent and not to fight drug problems in Mexico. Many of the members say they now fear for their own lives upon their return to Mexico. Alejandro Hope, an independent security analyst, told the BBC: “I can understand the politcal logic of trying to put this behind the country, but I don’t think there are the objective conditions for the country to turn the page. “The government has provided a narrative of what happened but hasn’t yet provided an explanation. In November last year President Pena Nieto announced plans to put all local police units under federal control and allow any local governments which have been corrupted by drugs trade to be dissolved by Congress. Additionally, the Inter American Commission on Human Rights (IACHR) signed an agreement with the Mexican government to investigate the events surrounding the missing students. The mysterious and certainly suspicious incidents have provoked international condemnation, nationwide protests, and have forced many Mexicans to push for change. The mass disappearance has catalysed the possibility of a historic break from learned pessimism and passivity. The general feeling, however, is that the young men should not be viewed as collateral in a larger Mexican drug war. For the families, at least, it may eventually provide some long awaited answers.